When you want to decorate a room and make it special, use what millions of people have done in countries around the world for hundreds of years. Use natural wicker furniture as your best option. Natural wicker makes a room warm and cozy offering a great way to furnish and style a room with elegant choices. There are many different pieces of new wicker furniture on the market and many collectibles that can offer from old world to modern styles. Choosing one that satisfies your decorative instincts is where you want to start. Generally, your first instinct is the best. Check out Pinterest and search for some wicker furniture. Its a great way to view many different types of furniture in many different settings. Don’t be afraid to bounce around on different boards and see what others have posted and like. Natural wicker furniture is crafted from rattan or other popular organic plant parts such as willow or palm that can be woven on frames. Sea grass is becoming very popular. Regardless of the material, they all make fine furniture and will last a long time. Wicker furniture is very stylish. You do not receive the same sensation from looking at wood furniture as you when admiring wicker. Hand crafted wicker furniture has character. The surface is not flat, its woven and uneven. It has nooks and crannies. It can be painted or stained, either way, it has charm and character. Some people say that wicker furniture gives you a warmth or homey sensation. It’s complexion is certainly not like a commercial reproduction of wood furniture, more individually different with a sense of home made. The craftsmanship is certainly evident. It takes many, many hours of intricate weaving and crafting to muster up a piece of wicker furniture that would otherwise have taken a lot less time to make a piece made from wood commercially. Recognize that all natural wicker furniture is hand made and that hand made furniture holds significant value both now and longer down the road. In as much as wicker comes with a finish, you can always change it by painting it. Painting wicker furniture can be done relatively easily and with great success. Painted pieces can match other pieces you have or migrate in to a color scheme in your home. Bright colors are being used in more modern designs. There are many different styles available in wicker furniture. There are some very ornate styles showing some real intricate design work and there are some simple boxy styles. Florentine designs provide graceful curves and elegance. Like most other furniture, wicker requires little maintenance. 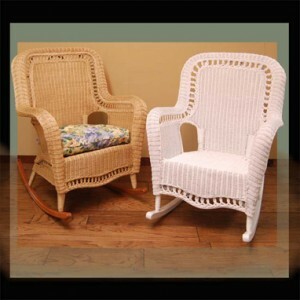 Cleaning dust from the furniture is probably the main factor in maintaining natural wicker. Wicker furniture is generally very strong but very light in weight as compared to many other types of furniture. As a result, when it comes time to vacuum and clean around the house, you don’t need to have a lot of muscles to move wicker furniture. It’s light weight makes it very desirable for those who like to rearrange their furniture often or move it for cleaning. For many years, natural wicker furniture was used both indoors and outside. Pieces used outdoors tended to deteriorate as compared to those used inside. Today, resin wicker is used outdoors reserving the natural wicker products for indoor use. Use in any room of the house. Seating and bedroom furniture are quite popular. Accessory pieces are great for decorating with. Don’t forget to Like Us on Facebook and Follow us on Twitter to receive more blog updates.